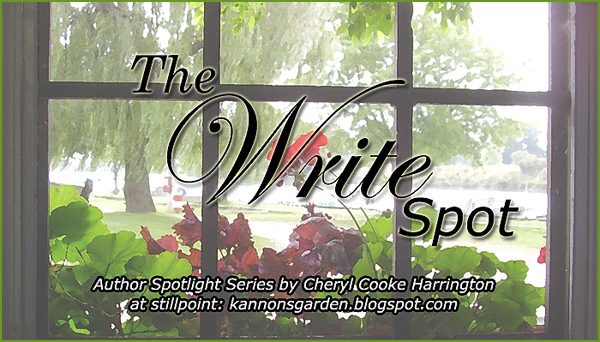 Welcome to the fifteenth edition of The Write Spot, a bi-weekly author series spotlighting the many and varied places where writers write. 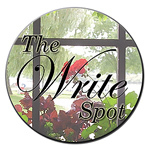 My guest this week is author Anne Cleeland, who has generously offered to send a very special prize to one lucky reader of The Write Spot. Read on for details. 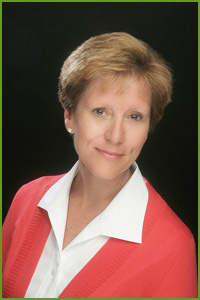 Anne Cleeland is a lifelong Southern California resident, and currently makes her home in Newport Beach. An attorney by trade, she's been reading mystery and romantic suspense since her Nancy Drew days, and especially loves Agatha Christie and the other Golden Age British mystery writers. 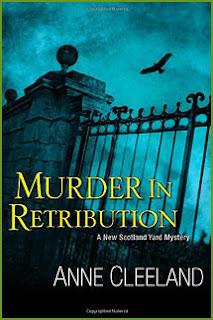 Her Acton and Doyle mystery series features two Scotland Yard detectives, and if you're a fan of Masterpiece Mystery, I think you'll enjoy this series. Anne also writes historical fiction because she loves historical novels, too. Being a romantic at heart, all her stories have a strong romantic element. 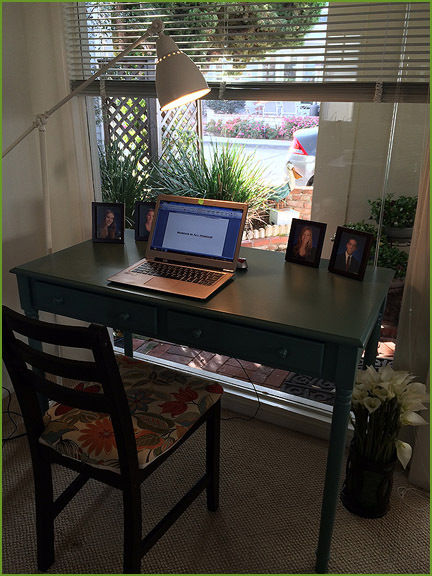 Tell us what makes this 'The Write Spot' for you. Love the pelican! Other than your computer or laptop, what's the one thing you couldn't be without in your Write Spot? 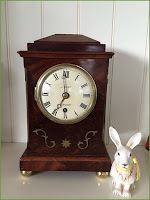 Here's my Regency clock. When I'm not writing mysteries, I write historicals set in the Regency period (early 1800s) and when I was on a trip to London about four years ago, I walked past a clock shop, and saw this clock in the window. I had to use my "emergency" credit card to buy it, but it was worth every penny. I love to think that I have something that dates all the way back to the era I write about. I am serializing a historical on my website (for free!) and posting one chapter per week – I think we're up to chapter 26, now. It's called The Bengal Bridegift. Take a look: annecleeland.com. I am also finishing up the fifth book in my Scotland Yard mystery series; it's called Murder in All Honour. Hopefully, soon I will have a publish date for the fourth book, Murder in Containment. I've had to change publishers, and so that's goofed up the schedule. I hear from a lot of impatient fans – sorry-sorry, everyone! Please contact me on my website, I love to hear from readers! And I'm on Facebook and Twitter. For those of you interested in looking at sample chapters, here’s a link to my Amazon Author Central page. Thanks so much for having me, Cheryl! My pleasure, Anne. Thank you! Available now: Anne Cleeland's captivating mystery series, following the perilous exploits of two Scotland Yard detectives as they track down London's most elusive killer. Giveaway! Anne will send the first three books in the series to one lucky reader of The Write Spot – details below. First-year detective Kathleen Doyle and Chief Inspector Michael Sinclair, Lord Acton, are a most unlikely pair. An Irish redhead of humble beginnings and modest means, Doyle is the antithesis of Acton, the British lord who has established himself as a brilliant but enigmatic figure with a knack for solving London's most high profile homicides. But Acton senses something exceptional beneath Doyle's awkward naivete and taps her to help him with his investigations. And her spot-on intuition is just what he needs to solve a chilling string of murders. When a horse trainer is found dead at a racetrack, Doyle and Acton begin interviewing witnesses and the victim's associates, but the killer continues to strike and they're left with more questions than answers. Their investigation is further muddled by their colleagues at CID Headquarters, whose career-driven jealousies and workplace blunders could jeopardize the case – and their nosing into the nature of Doyle and Acton's after hours relationship could lay bare the most classified information of all. Perhaps the trainer was the target of a jilted lover on a killing spree. Or maybe the victims were collateral damage in a political coup gone awry. As the murders pile up, Doyle and Acton uncover something far more sadistic than they could have imagined, and now that they know too much, they'll find themselves squarely in the crosshairs of a cold-blooded killer. Despite their investigative prowess, Chief Inspector Michael Sinclair, Lord Acton, and rookie detective Kathleen Doyle stir more than a few feathers at CID Headquarters when their relationship comes to light. But office politics quickly become trivial when a rash of underworld murders shatters London's normally austere facade. With a growing list of successfully solved cases to her name, the ever-dauntless Doyle shakes off the gossip and sets out to investigate the escalating turf war. As the body count climbs, Doyle uncovers a seedy world where fractious members of the Russian mafia and an Irish terrorist group are fighting for control of a lucrative underground business. 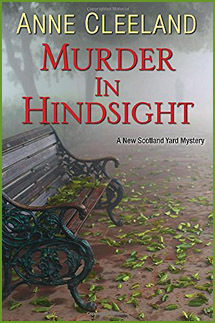 But their crooked deals and volleying acts of revenge are almost too much for Scotland Yard to keep up with, and when Doyle notices that Acton seems unusually troubled by the crimes, she begins to wonder what sparked the conflict in the first place. 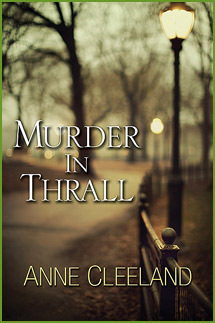 Perhaps there's nothing more to the murders than under-the-table business dealings gone awry. Or perhaps a single act of vigilante justice fanned the flames that ignited a vicious turf war. As Doyle and Acton fight not to become the next victims, they'll find that the truth may be best left unspoken, and retribution may be best left to fate. The victims are all criminals who eluded justice – until they ran afoul of an avenger whose modus operandi is a bullet to the back of the head. The key to the vigilante's identity lies in connecting the cold cases to an event that may have triggered retribution after all these years. Meanwhile, Doyle finds herself shadowed by a mysterious figure. After the man steps forward to rescue her from harm, she wonders why he is invested in protecting her. But when she learns he's in contact with Acton's nemesis, she fears she’s being used in a plot against her husband. The stakes are high, and both Doyle and Acton must work independently to outwit the players – before their lives are brought crashing down like a house of cards. Here's your chance to catch up on Anne Cleeland's wonderful Scotland Yard series before book four, Murder in Containment, is published! Anne has generously offered to send copies of the first three books in the series to one lucky reader of The Write Spot. To be entered in the random drawing, just leave a comment* and be sure to include your e-mail address so I can let you know if you've won. My trusty sidekick, Sam the Cat, will help choose a winner when he wakes up next Wednesday morning – and we all know cats like to wake up verrrry early, so please leave your comment before 12:01 AM Eastern Time on February 24. UPDATE: The giveaway has now ended. Congratulations to the lucky winner, Prentiss G! They all sound like wonderful reading! Thanks for sharing with us! Your mystery series sounds wonderful, Anne! Looking forward to reading some of your mysteries. I'm very glad to have been introduced to your books through this blog! Thanks for sharing the photos. I appreciate learning about your space. I too like having sunshine. 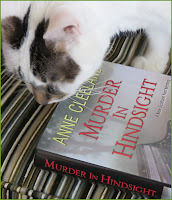 I love all your books --mysteries and historicals. I am one of your fans patiently waiting for the next book but am enjoying the weekly chapters of the Bengali Bridegift in the meantime. Thanks. Anne, love that you bought that clock for yourself. Gives you a tie to the times you love to write about. Your series sounds really good and if Cheryl recommends it then I now have it on my list of books to read. Why the Pelican? I'm with you on the sunlight, especially in the middle of our rainy season. And as for Sam choosing the winner of the books, there could not be a better judge. I discovered Anne's mystery series almost a year ago, and devoured all three books in les than three days. Just borrowed them again from the library to re-read. I really like the Lord Acton and Kathleen Doyle characters and the mysteries presented to them. I am one of those fans anxiously awaiting the next book! I have all three of the books in this series, and they are great. If you haven't read them, you are missing out. I read them out of order, and it did not matter, but I would recommend that you start with the first book if you can. I can't wait for the new book. I would love to win these novels, they sound right up my alley!! These three Acton and Doyle books have become a series that I reread with some regularity. They are great. Acton and Doyle are such different characters that I am surprised at their actions and interactions each time I have read the series. Can't wait for the new books in the series. I certainly recommend that any mystery reader try this series. I would love to start reading this series! They sound like books I would really enjoy! Thank you for such a generous giveaway! I enjoyed the Acton and Doyle series so much I assigned it for my mystery reading group this month. I am glad to hear there will be a book four and five. Look forward to reading them.